Robots and automated machines and vehicles form an integral part of our everyday lives, and are not just found in the industrial sector: precise control of motion is indispensable. The combination of the two areas of technology – motion (servo drives) and movement (AGVs) – allows KOLLMORGEN to play a leading role in “Motion in Movement – 4.0 Ready” solutions, and to offer its own customers complete and integrated systems, ready for Industry 4.0. In order to be able to adapt, reconfigure, and make best use of the available resources with the aim of achieving an increase in productivity, it is essential to have the correct inputs available that provide the opportunity to “make a decision”. This decision may be taken completely autonomously by a sub-system in the smart factory or by a human operator. It is important that the information is available at the exact moment when it is necessary to make the decision. For this reason, the Industry 4.0 system is based on the availability of information that translates into the concept of connectivity and the Internet of things (IoT). The “Internet of things” (IoT) is an evolution in the use of the Internet, a system of communication and connectivity between objects that improves people’s lives by exchanging data in a secure way between mobile devices and systems: the objects (the “things”) make themselves recognizable and acquire intelligence due to the fact that they can send data themselves and access information aggregated on behalf of others. Here are some examples: alarm clocks that ring earlier if the traffic is heavy; sport shoes that transmit times, speed, and distance so the wearer can compete with people on the other side of the globe; medicine bottles that inform relatives if a person forgets to take their medication. All objects can take on an active role through their connection to the Internet. 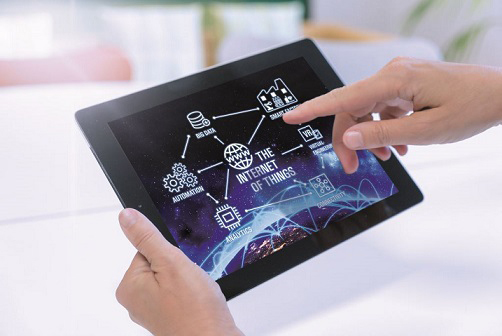 The objective of the IoT is for the electronic world to map the real world, giving an electronic identity to things and places in the physical environment. Objects and places that have radio frequency identification (Rfid) tags or QR codes communicate information across networks or to mobile devices such as cell phones. There are many different fields of application, ranging from industrial applications (production processes), to logistics and infomobility, right through to energy efficiency, remote assistance, and environmental protection. KOLLMORGEN products offer all of this and are therefore “4.0 ready”. AKD drives, AKM motors, KBMs, DDRs, as well as PCMM controllers are capable of transmitting information about their status completely independently (e.g., temperature of the switchboard, drive, and motor, current voltage and power, vibrations, number of cycles, and much more). This is all done using the MQTT protocol, a message protocol on a very low band width based on the publish/subscribe model, which, via the Cloud, allows mapping of the status of a machine that uses Kollmorgen products and therefore permits this status to be accessed using any mobile or fixed device in any part of the world. KOLLMORGEN’s KCM energy-saving modules store the kinetic energy generated by the motor when it is operating in generator mode and feed it back to the motors when it is required. KOLLMORGEN cables contain a QR code by means of which an operator can verify the originality of the product and access, via the Cloud, the respective test report that contains the specific characteristics of the cable in question. The CVC600 Vehicle Controller for AGV systems also makes intensive use of IoT technology. NDC Solutions operates the most advanced navigation technology: natural, reflector, spot, magnetic tape, inductive wire, and multi-navigation. AGV systems offer great flexibility for modifying the production layout without making changes to the infrastructure, thus making it possible to increase the efficiency of production and warehouse management without expensive investments. There are various advantages to this, including a long life span for vehicles, controlled and reconfigurable movements, and reduced energy consumption, all of which result in higher productivity. One of the benefits of automated guided vehicles is certainly the factor of safety in the workplace: the reduction of risk of injury to people and damage to property, which is often linked to the movement of heavy materials, is significant. In a smart Industry 4.0 company, therefore, people and robots/automated machines can coexist in the same workplace to achieve more efficient, flexible, interconnected, and secure production.